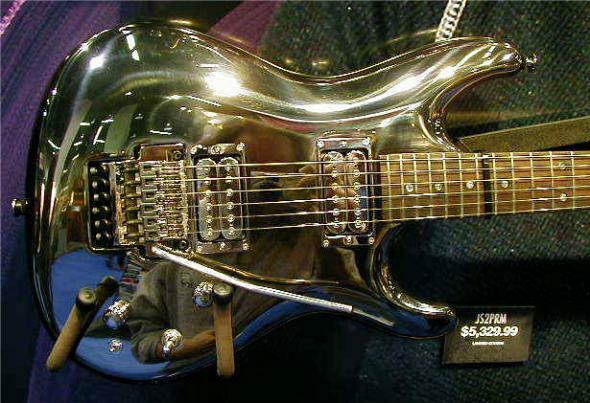 In 2005, the JS2PRM was Ibanez’s third attempt to recreate the chrome guitar. Ibanez’s first two attempts, the JS2 and the JS10th, both were unsuccessful due to finish problems. The process of bonding a chrome finish onto a wood bodied guitar is an extremely difficult process. The JS10th (2nd attempt) a luthite body was used, which is similar to plastic, and the results were better than the original JS2 Chromeboys, however, they were still beset by water marks and peeling and sounded nowhere near as good as the basswood body. Hoshino INC, used a process called Vacuum Metalizing to get around these finish problems. Essentially the guitar is coated with a conductive paint which is polished to perfection before having it’s final high-tech atomized coating, made from aluminum which has been vaporized in a vacuum chamber to form a cloud. It is then attracted to the guitar body electrically forming a thin layer of aluminum, which is then again polished to perfection to give the guitar its final finish. Though the JS2PRM is not as bright as the original chromeboy finish, it is more cosmo in color, and just as spectacular. The end result is not only exceptional, its a rare beauty. 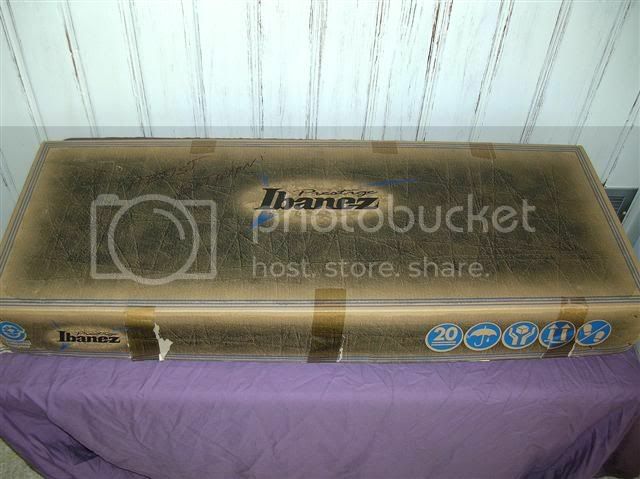 Ibanez have stated that they will not make any more guitars with this type of finish, bolstering this guitar as a true classic which is already a collectors item. With rumors of the JS2PRM valuing over $20,000 – $30,000. With only 60 of these guitars ever to have been produced and possibly only 35 in the U.S (according to Jemsite.com), having one in our possession is a true honor. And we can guarantee you that they look even better in the flesh. Every time you open the (matching) chrome flight case and see this shiny masterpiece, it is truly breath taking! Gear-Vault has one of these in for review. 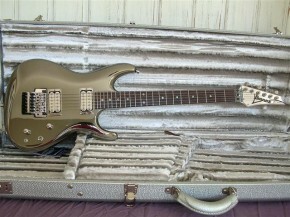 If there is any specific questions that you would like to ask about this guitar, please vist us at Gear-Monkey.com Message forum. As soon as we figure out the best way to take photos and videos of this axe, we’ll post them here. Stay tuned! This is the first time I viewed your website so please excuse my ignorance. Is this / will this JS2PRM be up for auction anytime soon? What year yas it made – 2005 or 2006? Great website by the way–WOW. I’m glad a stumbled upon it searching for JS2PRM!